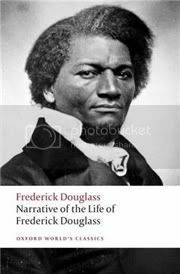 The Narrative of the Life of Frederick Douglass is probably one of those books that need no introduction, but, being as wary of assumptions as ever, I’ll introduce it anyway: published in 1845, it’s one man’s account of his life as slave; of how his hard-earned literacy was one of the main causes of his determination to gain his freedom; and of how he finally made his escape – this last part is told only vaguely, because back when the book was published the information could still be used by slave-owners to capture future escapees, and Douglass certainly didn’t want that. I found this detail particularly moving. As I read The Narrative of the Life of Frederick Douglass, I kept thinking that what it does is a great example of why stories (narrative non-fiction and fiction alike) are so powerful. On the one hand, Douglass’ narrative didn’t teach me anything about slavery that I didn’t already know. I hope that doesn’t sound like a smug and dismissive, “Oh, I know all about slavery already” – I just mean that because I have read about it in the past, the experiences Douglass describes were not new to me. However – and this is the important thing – he was new to me. Frederick Douglass comes across as an incredibly intelligent and kind human being. I grew to like him a lot, and he was a slave. Getting to know him through his autobiography is the closest I’ll ever get to having a friend who experienced slavery directly, and that makes it all seem so much more personal and real. I really appreciate the fact that books have the ability to do this. The Narrative of the Life of Frederick Douglass is, among other things, a testament to the power of literacy. Frederick Douglass says he was so determined to learn how to read exactly because his masters were so determined not to let him – and once he did, the very thing they feared happened. The world opened up to him; he had access to ideas and thoughts that confirmed every suspicion he ever had about the unfairness of the system that imprisoned him. It’s interesting to think that the very prohibition of literacy among slaves back then was an acknowledgement of how powerful the written word can be. She was entirely unlike any other white woman I had ever seen. I could not approach her as I was accustomed to approach other white ladies. My early instruction was all out of place. The crouching servility, usually so acceptable a quality in a slave, did not answer when manifested toward her. Her favor was not gained by it; she seemed to be disturbed by it. She did not deem it impudent or unmannerly for a slave to look her in the face. The meanest slave was put fully at ease in her presence, and none left without feeling better for having seen her. Her face was made of heavenly smiles, and her voice of tranquil music. The language he uses is a little dramatic in a nineteenth-century sort of way (I liked this about the book, but I realise that none everyone will), but I find the idea he presents here (and in several other parts of the book) not only crucial to an understanding of slavery, but also to an understanding of how racism and other –isms work even today. The fact that we are taught, for whatever reason, that our relationship with a whole group of people can only be one of power dehumanises both us and them. This might seem pretty self-explanatory and easy to grasp, but I so often feel, in conversations about racism and etc., that people assume that it’s all about one Horrible Human Being who is out to get another human being. Saying it’s a system is not the same as letting the individual actors off the hook, of course, but it is a way of moving away from personal animosities towards a more useful understanding of why people feel justified in treating other human beings as if they were less than human. Has anyone read Frederick Douglass’ other two autobiographies? Should I read them? As I read and contemplated the subject, behold! that very discontentment which Master Hugh had predicted would follow my learning to read had already come, to torment and sting my soul to unutterable anguish. As I writhed under it, I would at times feel that learning to read had been a curse rather than a blessing. It had given me a view of my wretched condition, without the remedy. It opened my eyes to the horrible pit, but to no ladder upon which to get out. In moments of agony, I envied my fellow-slaves for their stupidity. I have often wished myself a beast. I preferred the condition of the meanest reptile to my own. Any thing, no matter what, to get rid of thinking! It was this everlasting thinking of my condition that tormented me. It would astonish one, unaccustomed to a slaveholding life, to see with what wonderful ease a slaveholder can find things, of which to make occasion to whip a slave. A mere look, word, or motion,—a mistake, accident, or want of power,—are all matters for which a slave may be whipped at any time. Does a slave look dissatisfied? It is said, he has the devil in him, and it must be whipped out. Does he speak loudly when spoken to by his master? Then he is getting high-minded, and should be taken down a button-hole lower. Does he forget to pull off his hat at the approach of a white person? Then he is wanting in reverence, and should be whipped for it. Does he ever venture to vindicate his conduct, when censured for it? Then he is guilty of impudence,—one of the greatest crimes of which a slave can be guilty. Does he ever venture to suggest a different mode of doing things from that pointed out by his master? He is indeed presumptuous, and getting above himself; and nothing less than a flogging will do for him. Does he, while ploughing, break a plough,—or, while hoeing, break a hoe? It is owing to his carelessness, and for it a slave must always be whipped. If I had been killed in the presence of a thousand colored people, their testimony combined would have been insufficient to have arrested one of the murderers. Master Hugh, for once, was compelled to say this state of things was too bad. Of course, it was impossible to get any white man to volunteer his testimony in my behalf, and against the white young men. Even those who may have sympathized with me were not prepared to do this. It required a degree of courage unknown to them to do so; for just at that time, the slightest manifestation of humanity toward a colored person was denounced as abolitionism, and that name subjected its bearer to frightful liabilities. The watchwords of the bloody-minded in that region, and in those days, were, "Damn the abolitionists!" and "Damn the niggers!" There was nothing done, and probably nothing would have been done if I had been killed. Such was, and such remains, the state of things in the Christian city of Baltimore. Wonderful review, Ana! I haven´t actually read this book, but it´s come up so often in my studies that I feel like I have (I really want to read it at some point though! ), is that weird? I completely agree that the system of slavery dehumanizes both sides of the colour line. The poison of power! I have read other books *about* Douglas, including many of his speeches, and one thing that is clear is that he had an excellent understanding of law, and his analysis of the U.S. Constitution is absolutely still relevant today. I also think that his understanding of, and feelings toward Lincoln are among the most astute of any observer or biographer. This is one of those classics that one day, one day, I will get around to reading. It sounds fascinating! I haven't read this so I'm glad you included a synopsis of the plot :) I also love how the assumptions back then really prove how powerful the written word is - they weren't allowed to become literate because the slave owners knew what the written word could do. And still can do. What it still can do is teach us, as this book seems to do. Great review, and great point about how it isn't simply a few bad people, racism and other -isms can be built in to the very fabric of society - into our popular culture and teachings, and we don't even always realize it. The other of his autobiographies are interesting, but this one really is the crown jewel. If you had a very strong postive response, they are probably worth reading, but this is really the best one. I have had very little experience with this book, but I think it sounds like an excellent read, and like something that I could really learn a lot from. Even though you say that the prose is a little overwrought at times, I still think this would be an incredibly powerful read!! I've never read any of his biographies, but the life of Douglass is a fascinating one, and that part you mentioned about slavery corrupting people who "own" slaves is really interesting to me. And then to thing about people who grew up believing that was right and proper? It is a form of abuse in its own right. But that's more an objective stand back and isn't it interesting sort of reaction. The very idea is slavery is so horrific that it boggles the mind really. I'm always happy to see someone picking this one up on their own. I've assigned it in undergrad history classes before with great success. Douglass was an extremely likable man, and his story is one that resonates with many people. Yay! Glad you loved this one. I read it in college, and it was by far the most enlightening part of a history class my freshman year. I don't remember if we've discussed it, but if you haven't read Incidents in the Life of a Slave Girl by Linda Brent/Harriet Jacobs, it is not to be missed. These two are by far my favorite slave narratives and two of my favorite works of American lit. in general. Frederick Douglass is required reading (or should be)... I can't remember which of his books I've read but his story is powerful. Whenever I see pictures of Frederick Douglass it comes as a surprise because I always picture him as Morgan Freeman, because of how many times he's played him. Great review! I forgot how much I want/need to read this book! I included it as part of My Friday Five. The Narrative is one of my favorite books to reread. Every single time I am in awe of the genius and intellect of Douglass, as well as his cold and precise analysis of the corrupt slave owners. Great review! I'm glad you liked Frederick Douglass! I thought you would. I know I've gushed about him at length, which leaves me nothing else to say about him, but I just love him so, so much. If I were the boss of the world I'd put his face on the $20 bill instead of rubbish Andrew Jackson's. I haven't read his other two biographies, but my understanding is that they're a lot of the same material, but expanded and changed in some spots. If I'm remembering right, he does eventually tell how he escaped, maybe in the last book he wrote, after the Civil War was over and the slaves were all freed. But yeah, I haven't read them. I have read this one but I haven't read the other two in the entirety. In my life as an editor I have became familiar with the other two biographies -- there is some different material and some stories were changed a bit, but you probably have the general idea. I know exactly what you mean when you say that you know it but this story opened other venues. I felt much the same way when I read it. My high school history teacher once told me to never use the phrase " I have a friend who is..." because what you are really doing is generalising, and I agree that that is dangerous. I have never heard of this one but certainly will be adding it to my TBR. I'm reading Uncle Tom's Cabin at the moment so definitely a re-newed interest in slavery. I learnt about it in school of course but since haven't really read by-choice into it. I have Olaudah Equiano's autobiography that I have wanted to read ever since coming across him in an English literature exam and I finally got myself a copy about a month ago. Have you read it? It was published in 1789 and played a big part in the British abolition of slavery. I also have Roots to read (I read most of it when I was about 15) so to cut a long ramble short, I'm very glad to have found this book through your blog. What a great review. I read this for an African American Lit class I took a few years ago and enjoyed it as well. My son is reading Uncle Tom's Cabin for part of his summer reading for school next year. We should add a book about Frederick Douglas to his list. I haven't read this, but I love the two points you made -- that it's a testament to the power of literacy and it explores the fact that slavery dehumanizes *everyone* involved. And I am amazed that he had such a great capacity for empathy that he wrote about his mistress in Baltimore the way he did. This sounds fascinating, wonderful review. Great passages too, I need to read this one. You always pick such interesting books. I've read The Narrative of the Life of Frederick Douglass a couple of times, both I think as assigned reading. It made an impression on me and I really admire Douglass. I started reading a biography of him once that was intriguing, but didn't get to finish it because it was due back at the library and I was leaving the area. This is one of those books that a portion gets included in many anthologies and textbooks, so I've read parts of it, but not the whole thing. This is a great review of a much deserved read. Thanks, Nymeth! Bina: lol, I have some books I could say the same about. Thank you for the recommendations - I haven't read either of those and they both sound extremely interesting. Jill: That's so fascinating! Especially considering the fact that circumstances forced him to take his education into his own hands. He was clearly an extremely intelligent man. Amanda: I think you'll like it! Amy: I think it's interesting that book banning happens almost by default in any dictatorial regime. That says a lot about what books can do! And yeah, I think we don't always realise it, and we still get a bit defensive when that's pointed out, which sadly doesn't help. The Ape: Hmm... I did like him enough to be intrigued, so I think I'll put them on the list but not make them a top priority. Fence: It absolutely does. It's so strange to think about. I don't think it's that all the people involved in the whole system back then were monstrous, but it can be chilling to think of the lengths humans will go to to justify the unjustifiable. Katy: Thank you so much for that link! That was amazing. Daphne: Yes, if he isn't he should be. Kate: Thank you again for including it! Bibliophilic: "...as well as his cold and precise analysis of the corrupt slave owners". Yes, exactly! His ability to analyse something he was involved with directly SO clearly absolutely awed me. Jenny: So, where do we vote for you for boss of the world, then? :P That's too bad that the other two biographies are reworked :\ Somehow I had convinced myself they'd be about other periods of his life, like what happened after he escaped and became involved in the Abolitionist movement. Beth: As I was telling Jenny, that's too bad. I was hoping they'd be new material. Zee: I think your teacher is absolutely right when it comes to using that sentence to either pretend we're above racism because we have a friend of another race (and people usually follow "I have a friend who's..." by saying something extremely racist), or by claiming we know *all* about racism because we know someone who experienced it. It horrifies me to think I sounded like I was saying either of those things. I guess it was an unfortunate choice of words on my part, but I thought that my explanation of the personal collection literature allows me to feel with history was different enough from either of those situation that it wouldn't sound like the same. Fiona: I haven't read Equiano's biography, but just like Douglass' until recently it's on the list. Someday! Anyway, I think this would be an excellent follow-up to Uncle Tom's Cabin. Brenna: Thank you! I'm glad you also enjoyed it. Kathleen, I think it'd be an excellent addition! Stephanie: I know! That was one of the things I loved about him. I guess his awareness of the dehumanizing effects of slavery kept him from ever doing it himself. Naida: I hope you find it was interesting as I did. Christy: Aw, that's too bad! I'd love to read a biography published after his lifetime, as I'm sure it'd assess his overall impact in a way his own work couldn't. I had to read this in high school, and it is definitely a powerful story. His other two biographies aren't quite as good, I don't think, but still worth reading.